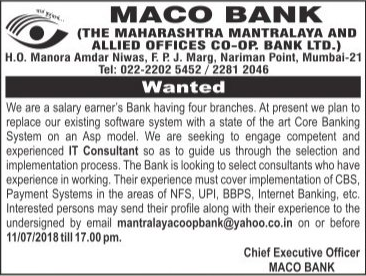 MAHA MACO Bank (Maharashtra Mantralaya And Allied Offices Co Operative Bank), Mumbai Published Job Notification for IT Consultant Posts. Candidates who wish to apply must look at MAHA MACO Bank IT Consultant Recruitment 2018. Eligible candidates can apply Online before 11-07-2018. Starting Date, Last Date to Apply Online at Maharashtra Mantralaya And Allied Offices Co Operative Bank which candidates should be remembers as follows. Start Date to Apply Online: 05-07-2018. Last Date to Apply Online: 11-07-2018. 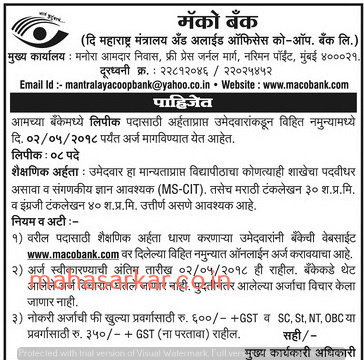 MAHA MACO Bank (Maharashtra Mantralaya And Allied Offices Co Operative Bank), Mumbai Published Job Notification for 08 Clerk Posts. Candidates who wish to apply must look at MAHA MACO Bank Clerk Recruitment 2018. Eligible candidates can apply Online before 02-05-2018. Education Qualification: Graduate with MS-CIT/ English Typing Speed 40 wpm & Marathi Typing Speed 30 wpm. For Post wise Education Details follow the detailed advertisement. Interested & Eligible candidates can apply Online through the website macobank.com earlier than the due date. Last Date to Apply Online: 02-05-2018.